For my ever-expanding interest in knitting spa cloths, I picked up a keen interest to run the cable nearly at the edges of a seed stitch spa cloth. So far, this is what I’ve come up with. Row 1 (Wrong side): seed stitch for the next 6 stitches, beginning with knit stitch, purl 6 stitches, seed stitch beginning with knit stitch until 12 stitches remain, purl 6 stitches, seed stitch remaining 6 stitches beginning with knit stitch. Row 2 (right side): seed stitch the first six stitches beginning with purl stitch, knit 6 stitches, seed stitch beginning with purl stitch until 12 stitches remain, beginning with beginning with knit vi stitches, seed stitch remaining 6 stitches beginning with purl stitch. Cable Row 10: purl six stitches in pattern, cable 3 stitches to the front, knit 3 stitches then remaining 3 stitches from cable (6 total knit stitches), continue seed stitch in pattern until 12 stitches remain, cable 3 stitches to the back, knit 3 stitches then knit remaining 3 stitches from cable (6 total knit stitches), seed stitch remaining 6 stitches in pattern. 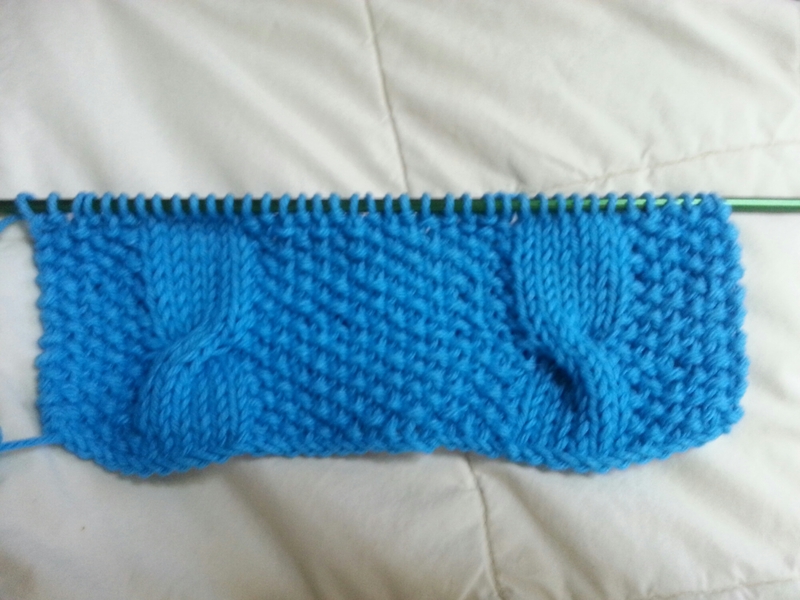 In the picture, above, I have knit approximately 21 rows, and think on the 23rd row I will do a cabled row in pattern. My comments so far, is that I have achieved the open beachy Mediterranean feel that I was going for in the seed stitch. I thought the cabled 6 stitches are just too thick and strong for the soft seed stitch background. Look at the stretching and pulling of the lower edge. The corners are warped and distorted, and the cabling is extremely bumpy and not flat when laid down. I think that if I try this again, I will decrease the outer 6 seed stitches to 4 or even 3, and keep the cables down to approximately 4 knit, 2×2 cables. Despite not achieving what I thought would be a cute beachy soft airy look, I do feel that the cables, while thick significant and beefy, certainly do look cheerful, charming and welcoming for the spa bath that I envision. I hope to keep trying, and eventually publish this cute cute pattern, which I have copyright so far.